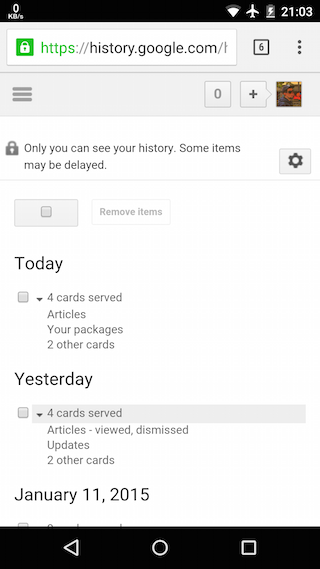 Google Now has a history page that shows the number of cards served each day, the type of cards and it lets you delete historical data. For example, you may find out that Google Now displayed 9 cards on January 8th: articles, updates, packages, music, stocks, time at home, birthdays and 2 other cards. Unfortunately, Google doesn't show the actual cards and you can't see the card history in Google Now's interface: there's only a link to the history page in the settings. That's one of the issues with Google Now: once you dismiss a card, you can't get it back. Total morons at Google to have remove this feature and not to provide the actual card information.